This year we will be studying the third chapter of Masechet Megilla in the Introduction to Talmud course. Megilla naturally refers to Megillat Esther, and therefore you might imagine that the masechet deals with the holiday of Purim. That is correct concerning the first two chapters; however, our chapter, other than the opening lines, deals mainly with the laws of the reading of the Torah. This is a text-based course. We will be mostly concentrating on learning how to read and understand the Talmudic text. The optimal way to do this is to have the traditional page of printed Talmud, what is called "tzurat hadaf," in front of you as we go over the text. This is important for a number of reasons. Firstly, if you continue to advance in your learning skills, that is the form of Talmud that you will be using. Secondly, the printed "daf" contains a great deal of additional material that we will be using, and learning how to use these aids is an important part of learning Talmud. In any event, the shiur I will be sending will contain the English translation of the Talmudic text under discussion, as well as a version of the original Hebrew/Aramaic text. Nonetheless, it is highly preferable that you obtain an edition of this Masechet in printed form, or at least photocopies of the relevant pages. Each week, I will provide a link for a copy of the printed page, courtesy of E-daf.com. The best edition of the Talmud with English translation is the ArtScroll edition, which also includes a running explanations and commentary. It provides, in my opinion, important tools for helping one learn on ones own, which is the goal of this course. Individual volumes can be purchased (the entire Talmud is tens of volumes). 2. Obtain a standard Hebrew/Aramaic edition of the masechet. 3. Download each week the copy of the "daf" which we will be learning. 4. Rely on the text of the lesson that you receive by email (not recommended). Each week, we will read and explain a short section of the Talmud. The lesson will begin with the text, and you should try to read the text and understand it on your own. In the course of my explanation, I will insert "pauses" to allow you to answer questions or fulfill other assignments. Obviously, there is no way for me to actually ensure that this is being done. But again, if you want to get the most out of this course, you will not merely read it. Unlike all the other courses in the VBM, this one is really based on our working together, so it is very important that you follow the suggestions and instructions in the text. The true goal is not to acquire the content of a few lines of Talmud, but to begin to learn "how to learn." The shiur this year will be sent in html format (similar to last year's shiur). It will come as an attachment to the mail message, which, when opened, can be read in a web browser. The following is basically the same introduction that was sent to the Introduction to Talmud course two years ago. Many of you have either already read it, or are familiar with the basic concepts and ideas from other sources. Still, in order to get started, we have to get past this point for all the students. Having an introductory lesson to a course entitled "Introduction to the Study of Talmud" might seem redundant. The answer, however, is embedded in the title of the course. This is not an introduction to the Talmud, but an introduction to the STUDY of Talmud. If I were writing an introduction to the Talmud, we could easily reach an entire year's worth of introductory lectures, which I think would in fact be interesting and informative, without ever reaching the actual learning of the text. However, most of the important information included in those lectures would not really be appreciated until we got down into the workings of text itself. In fact, for nearly all of the history of Talmud study, the only way one learned "how to learn" was by jumping into the text, a text that for thousands of years has been called the "sea of Talmud." That is the method I propose to base this course on. We shall directly attack selected text and, hopefully, progress. But first, for one lecture only, I shall present a few points, introductory points after all, before we begin the actual study. I assume that Aramaic, and perhaps Mishnaic Hebrew is not a language in which most of you are fluent. All editions of the Talmud are accompanied by running explanatory commentaries, the most important of which is that of Rashi (R. Shlomo Yitzchaki, 11th century France). But, I must admit, Rashi himself wrote in a mix of Hebrew and Aramaic. I therefore recommend that you acquire an English translation. While the text of each lesson will include a link to both the original and translated text, it will be far more efficient if you have a full text of the entire page in front of you. There are several translations of the Talmud, but, for our purposes, the best is the Schottenstein edition of the Talmud printed by ArtScroll Publishing. I recommend that you buy it, if you are serious about the course, especially if you hope to continue in the study of Talmud. While I recommend a translation, and will translate myself as we continue and provide a glossary, the text we are studying will be the original. The ability to read the Hebrew words is assumed. I shall be constantly referring to the Hebrew and Aramaic text (with explanation and translation); for again, the purpose is to introduce you to the study of Talmud as all students of Talmud study it, which is the original, with the traditional commentaries (all of which are not available in translation in any event). The Hebrew word "daf" means page. In the tradition of Talmudic learning, it means a leaf; i.e., a physical page, which of course has two sides. To distinguish the two, we use a postscript, so that the page we are beginning on is daf 21a. Take a look at this daf. You will see up on the left-hand corner the letters chaf-alef, which means 21. (On the web scan, this is circled in red and marked with the number 1). In all standard editions of the Talmud (but not the Schottenstein), the first side of a page (i.e., 21a) is always on the left side of the open volume. The reverse side (21b) does not have any Hebrew page number at all, but for several centuries has had an Arabic numeral, in this case "42" (Notice that the Arabic numerals refer to sides, while the Hebrew ones to full pages. Why? That's just the way it is!). Running down the middle of the page, in block Hebrew letters, is the text of the Talmud. On the page we are examining, a chapter (chapter two of Megilla) ends, which is marked by the large type words "hadran alach Hakorei Limafrei'a," which means "we will return to you Hakorei Limafrei'a (the name of the previous chapter). This is marked with the red number 2 on the webscan. This is followed by the opening mishna of the third chapter, which we will be studying. Notice that the first word of the new chapter ("Hakorei") is in an enlarged print. After the 14 lines of the mishna, we find the letters "gimel-mem" (number 3), which is the abbreviation for "gemara." This is where the gemara discussion of this mishna begins. The gemara discussion of this mishna will continue for 5 pages, but there is no rule for the relative length of a mishna and its gemara. 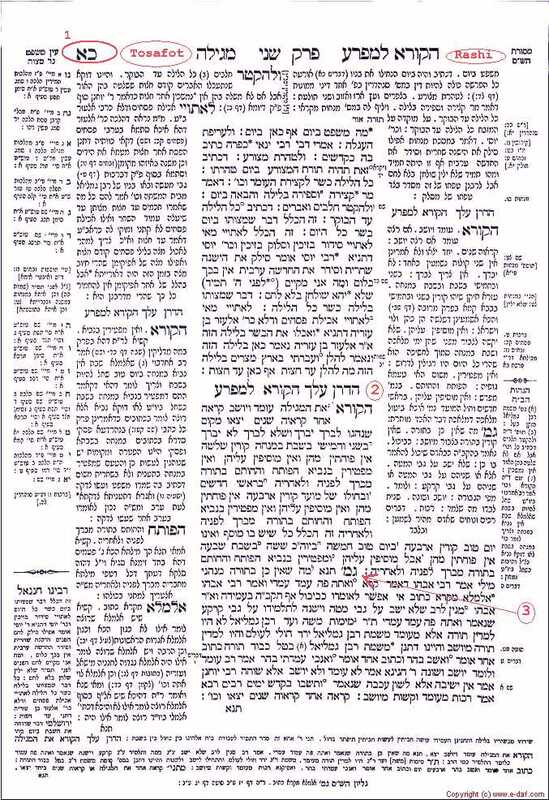 On the left side is a commentary consisting of several extended comments, each beginning with the Talmudic text to which it refers marked in bold letters. This is the "Tosafot," which simply means addenda. In true Talmudic tradition, the Tosafot do not have one particular author, but record the discussion in the French (and German) schools of Rashi's disciples for the next four or five generations. Very often, the starting point for these discussions was the commentary of Rashi, generally beginning with a question which will give rise to an alternate explanation. Try reading the mishna now, with Rashi, and using the translation, if you have one. We shall begin with this mishna in next week's shiur.